The Edo State governor, Adams Oshiomhole, has rename the Delta Crescent, where the mansion of the former chairman of the Board of Trustees of the Peoples Democratic Party (PDP), Chief Tony Anenih is located in GRA Benin City, after the his late Principal Private Secretary, Olaitan Oyerinde. It would be recalled that Oshiomhole in a tearful speech said that “a certain old man, in his 80s, a godfather, in Edo state” is the mastermind of the assassination of his principal secretary, Olaitan Oyerinde. Although he did not mention Chief Anenih’s name, sources within the Edo State government are accusing Tony Anenih of being behind the horrific act. 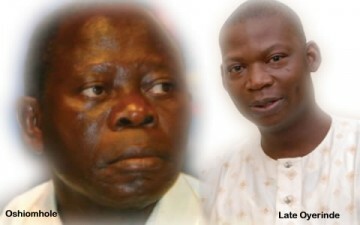 Oshiomhole made this pronouncement on Wednesday, during the Service of Songs for the deceased Oyerinde at Government House Benin City, said Oyerinde who was murdered at his residence last week, fought against god fatherism and the entrenchment of democracy and good governance in Edo state, “therefore it is very proper we rename Delta Crescent where a lot of big men resides, after him”. The Governor who spoke after a lengthy sermon by the District Pastor of Redeem Christian Ministry, Pastor Osagie Ize-Iyamu, who incidentally is the South South Vice-Chairman of the Action Congress of Nigeria (ACN), recalled his last interaction with Oyerinde, disclosing that he was killed barely 48 hours after he wrote a petition to the police. According to him, “after we learnt of how the PDP was plotting how to rig the election and destabilize the state, I spoke to Olaitan to write a petition to the INEC Chairman Prof. Jega. He was actually supposed to go with me to Abuja that day but he said we should go so that he will handle some things in Benin. Those cowards could not fight me during the day so they decided to go at night to kill Olaitan. “They have left a young widow and four innocent children behind. I want us to continue to cry but we will not cry any more. If Olaitan was alive he expects us to fight on because he is a fighter. The only way we can immortalize him is to ensure that his dream of good governance and democracy comes to stay in Edo state. I am glad President Jonathan has called for serious investigation to the murder. “We are hoping and praying that the police should find the killers. Nobody can kill with impunity any more. Those who killed Olaitan, God knows why but we know that God will not forgive them because what they did was wicked and unacceptable” he declared.